Mirror Pool, Bradford City Park, Yorkshire Yellow Day 2018. 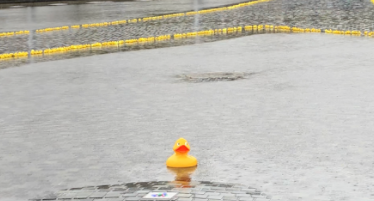 Today’s Hook- A- Duck event turned out to be a complete washout for the young competitors of Bradford. 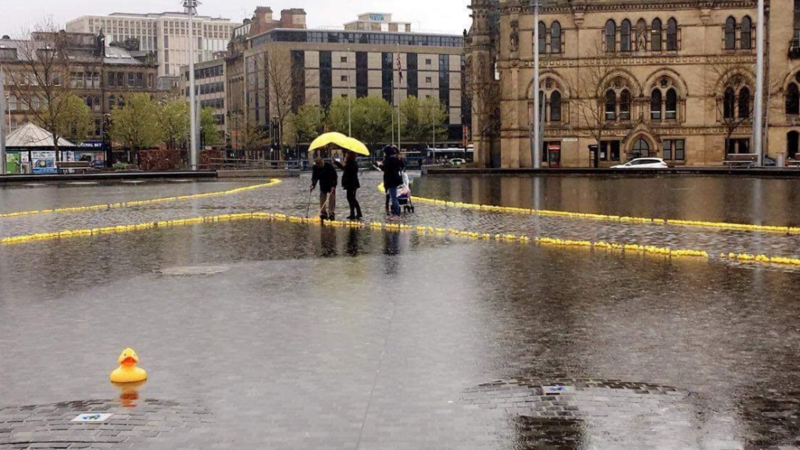 The Mirror Pool in Bradford City Park was filled with around 4,000 yellow rubber ducks all in the hopes to raise cash for Yorkshire Air Ambulance and The Tour de Yorkshire 2018. The aim of the game was to pay a pound for a chance to hook a winning duck, bagging you a prize donated by local businesses, whilst contributing towards a great cause. The Mayor, Abid Hussain, was also present to show his support and picked the first duck to get the game going. However, the children seemed to have more fun in the puddles, as parents took to nearby shelter from the rain. Despite this, the sea of yellow ducks aligned in a Y shape for ‘Yorkshire’ added to the charm of the event, showing people’s support for a great charity, whatever the weather. Robin Owen-Morley, West Yorkshire’s regional fundraiser for YAA, said; “It’s a shame because obviously it would have been much nicer if it was sunny, but it’s still amazing and it’s very exciting, it looks amazing too. To get involved with the charity, you can visit https://www.yorkshireairambulance.org.uk/donate/ and donate.